See larger images & get specific paper colors/patterns/etc. information by clicking on any Paper Pak in the top "slider bar"
When you are looking LOTS of variety & an interesting selection of papers in a particular color range, our "Colorways" Paper Paks are a great choice. 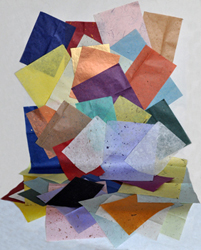 "Colorways" Paper Paks come in 4 different "colorways" groupings, including "Blues", "Yellows", "Purples", and "Jewel Tones". "Blues", "Yellows", and "Purples" each have 5 different sheets, measuring 17-1/2" x 11-34/" with lots of visible fiber. "Jewel Tones" has 9 different sheets measuring 12" x 8-3/4" each with a variety of visible, but more subtle fibers. These are wonderful papers to work with - the surface is relatively smooth, even though they have lots of visible fiber. One of my favorite paper types to use in collage, they are somewhat translucent and take paints and stains exceptionally well. "Colorways" Paper Paks are also ideal for covering lampshades, glass candle holders or anything that you might want the light to pass through. Click the button below to add the "Colorways" Paper Paks to your wish list.